Discussion in 'Football Forum' started by Samid, Nov 3, 2018. Another week City increase their GD by 3+. Will Fulham be able to keep a clean sheet this week? Come on devil. 3 points. We beat Spurs away, City matched our result. We need to go and match their result at the Emirates. Anything less and we can stop talking of ourselves as 'challengers' to City and P€p. Any team that doesn't aim to get 90+ points can forget about challenging. I genuinely think we could finish on 90-95 points and City would still beat it. Argued with a bunch of people last season, that City would still get 95+ points again. They said I was dreaming. Guardiola has only finished <90 once in his career...once. Who the hell thinks City wont get those points this season? It's a given that you'll need over 90 points to challenge. Some did. They said last season was a one time thing. It probably was but not in the way they probably thought. Guardiola has never broken the 100 point barrier, but I have them for 94-96 points this season because of the De Bruyne injury. City have been quite wasteful with their chances, which De Bruyne helped with since his finishing is top notch. 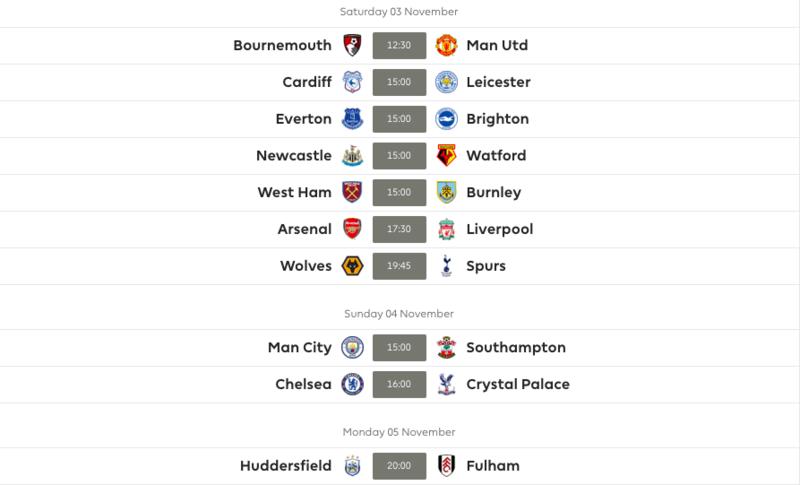 On another note, when did 7:45 fixtures on a Saturday become a thing? Are Bournemouth our rivals these days? Boo Smalling, yay De Gea. Evening PL game is a great idea. Half a day of PL football. They could've scored three or so goals in these first 10 minutes. And of course, now they do. Way too fecking easy. Sack Mourinho from First Halves! That ball from Cook was incredible. Really need to start putting Wilson captain in FF over aguero and lacazette. How did Wilson get to that ball before Matic? How are United level? Bournemouth all over them throughout the half. 100 point barrier means they cannot go above that point. All United now, should score in a bit. I smell a United goal coming. Rashford has to score that. Wow what a monster of a FK attempt that was. How on earth is it not a goal! United doing to Bournemouth what Bournemouth did to United in first half. I’d say United deserve to win this. Such nice quick passing & movement for that shot, but Begovic is having a good game. Are you watching? Are you watching Watford? Are you watching Spurs? Are you watching Everton? THIS is how you win a six pointer!